A membrane of squamous EPITHELIAL CELLS, the mesothelial cells, covered by apical MICROVILLI that allow rapid absorption of fluid and particles in the PERITONEAL CAVITY. The peritoneum is divided into parietal and visceral components. The parietal peritoneum covers the inside of the ABDOMINAL WALL. The visceral peritoneum covers the intraperitoneal organs. The double-layered peritoneum forms the MESENTERY that suspends these organs from the abdominal wall. 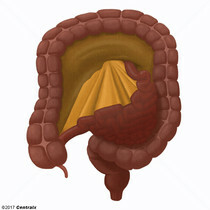 A double-layered fold of peritoneum that attaches the STOMACH to other organs in the ABDOMINAL CAVITY. The space enclosed by the peritoneum. 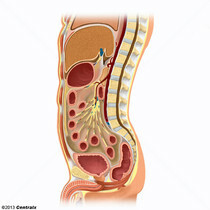 It is divided into two portions, the greater sac and the lesser sac or omental bursa, which lies behind the STOMACH. The two sacs are connected by the foramen of Winslow, or epiploic foramen. 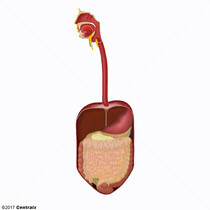 A layer of the peritoneum which attaches the abdominal viscera to the ABDOMINAL WALL and conveys their blood vessels and nerves. 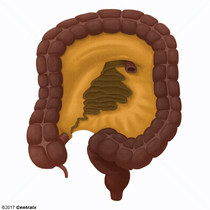 The fold of peritoneum by which the COLON is attached to the posterior ABDOMINAL WALL.